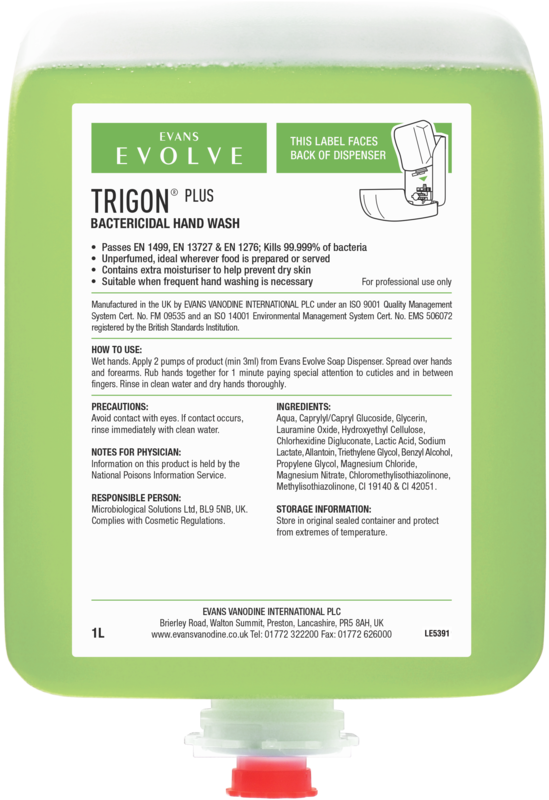 Evans Trigon Plus is a high quality, unperfumed, bactericidal liquid hand wash. Removes visible soiling and simultaneously kills a wide range of bacteria. Ideal for use in food preparation and processing areas, nursing homes, schools and hospitals. Extra moisturisers help leave the hands smooth and soft. Passes EN 1499, EN 13727 and EN1276. Proven to kill 99.999% of bacteria. Designed for use in the Evans Evolve cartridge dispenser. Also available as a 500ml pump bottle or bulk 5ltr refill bottle . Wet hands. Apply 2 pumps of product (min 3 ml) from the Evans Evolve dispenser. Spread over hands and forearms. Rub hands together for 1 minute paying special attention to cuticles and in-between fingers. Rinse in clean water and dry hands thoroughly. 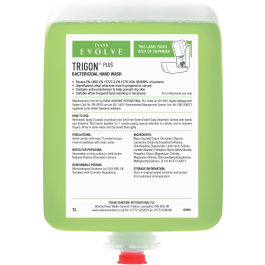 All surfactants used in Trigon Plus and other Evans Vanodine products comply with the current European Regulations concerning biodegradability and protection of the environment.